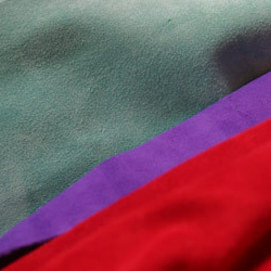 Super Silky Calf suede is another option for heavier suede with robust physical properties. 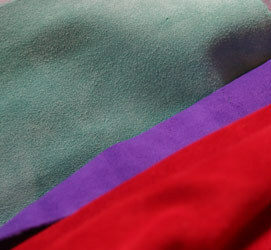 In substance 0.9/1.0mm this is a split suede which has quite a coarse fibrous finish but always an intense depth of colour. As with any suede there is a risk of dust transfer and care must be taken in combination with other materials to avoid colour migration. Whilst the thickness of these skins is not dramatically increased, the density is much greater giving a heavier feel to the product, and also some added strength which facilitates a greater range of use.